Liliana Velasco, Josclyn Nichols and Abigail Johnson Compete in Sectional Contest. 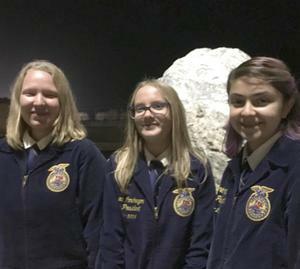 On Thursday three freshmen Lucerne Valley High School students — Abigail Johnson, Josclyn Nichols and Liliana Velasco — participated in the FFA 2018-19 Creed Recitation Sectional Contest. The competition was three-fold: 1) recite a five-paragraph speech; 2) answer impromptu questions; 3) take an assessment with two hundred questions. Liliana Velasco took second place, being honored with a ribbon and plaque. Josclyn Nichols placed fourth overall and received a ribbon. The competition was part of the High Desert FFA Prepared, Creed, BIG Contests & Proficiency/Star Selection.